From Goodreads: It begins as an assignment for English class: Write a letter to a dead person. Laurel chooses Kurt Cobain because her sister, May, loved him. And he died young, just like May did. Soon, Laurel has a notebook full of letters to people like Janis Joplin, Amy Winehouse, Amelia Earhart, Heath Ledger, and more; though she never gives a single one of them to her teacher. She writes about starting high school, navigating new friendships, falling in love for the first time, learning to live with her splintering family. And, finally, about the abuse she suffered while May was supposed to be looking out for her. Only then, once Laurel has written down the truth about what happened to herself, can she truly begin to accept what happened to May. And only when Laurel has begun to see her sister as the person she was; lovely and amazing and deeply flawed; can she begin to discover her own path. 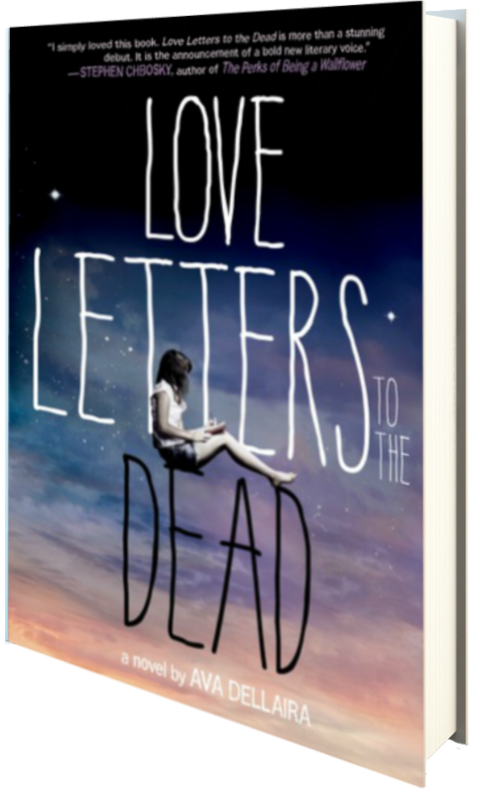 Love Letters to the Dead spans Laurel’s 9th grade year as she tries to sort through her life—her older sister May has only recently died and the circumstances behind her death remain shrouded in mystery as the novel unfolds, spurring readers on as Laurel relays many different facts about her life. This is an extremely well written epistolary novel that captured my attention immediately. I really adore novels told through letters, diary entries, and the like, and Dellaira does a superb job getting Laurel’s voice across using this writing style. When the novel first picks up, Laurel is writing a letter to Kurt Cobain, and as she begins to relate to him through their shared experiences, she starts to tell the story of her sister, and soon finds herself working her way through multiple letters and truths about the past, present, and future. With the death of May, Laurel’s family fell apart; her mother now lives in California, and Laurel splits her time between the homes of her father and aunt, yet none know the truth as Laurel does. And as the story unfolds, readers learn that there are many heavy underlying truths that Laurel must eventually face in order to move from the past and begin living in the present. I will admit that it took me a little while to warm up to Laurel, but as she pours out her heart, I found it impossible to not connect with her and her experiences, both trials and triumphs. One aspect of this novel that I truly love is that, as Laurel writes letters to the dead, she connects the dead’s lives, music, accomplishments, and decisions with those that she is currently experiencing. It flows together seamlessly, and helps bring validity and emotion to the novel as Laurel tells her story, asks her questions, and struggles with the answers. The letters show how Laurel is on a downward spiral, and as it all comes to a head, we learn what Laurel really knows of the night her sister died, and why Laurel has slowly allowed herself to become someone else as the school year progresses. It’s an intriguing, heartfelt read that I highly recommend. Four stars. In exchange for an honest review, Macmillan Children’s Publishing Group and Farrar, Straus and Giroux (BYR) have been extremely gracious in allowing me to read an ARC of this novel, via Netgalley, prior to its release on April 1, 2014.